Kaldewei stands for superior quality and exquisite design – with more than 100 design awards, it one of the most lauded bathroom manufacturers in the world. For Kaldewei, good design is about being durable and environmentally sound – it must also have magic. Made in Germany, Kaldewei’s baths, shower trays and enamelled shower surfaces are made using only natural and recyclable materials. An international style icon, Kaldewei’s signature high-quality and long-lasting 3.5 mm steel enamel offers a clean and hygienic, acid and impact-resistant, scratchproof and hard-wearing finish that comes with a 30-year guarantee. 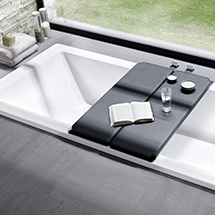 For almost a century to date, Kaldewei has remained at the pinnacle of sophisticated bathing.